Skull candles are the perfect accessory for any Halloween display. With a sinister skull face and an eerie glow, they can be used alone or as part of a bigger assortment of seasonal decorations to impress guests and trick-or-treaters. If you're looking for a skull motif for your Halloween candle selection, there are lots of different types to choose from. Here are just a few examples. These candles aren't just used at Halloween. They can also be used in candle spells, for everything from love and marriage to casting hexes. Skull candles come in lots of different colors, including a natural bone hue, black, and even neon colors for a funky display. The most popular time for candles featuring skulls to be found on store shelves is in the months and weeks leading up to Halloween. You can find them in craft stores, department stores, online, or anywhere that you would find seasonal decorations. If you're interested in saving a bit of money, pick up your skull candles just after Halloween. They're usually marked down at a deep discount so that stores can clear out their inventory for different items. Store your candles in a cool, dry place to use next year. Skull tapers - These taper candles use a stacked skull pattern to produce a really original presentation. They would fit right in at a seasonal dinner party, or even on a buffet table. 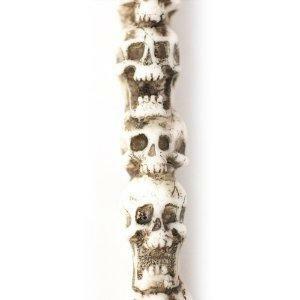 Other skulls - This site is based in the United Kingdom, but offers a glimpse into the other types of skull candles available. Some of them are almost cartoon-like, while others are very realistic. Mini Skulls - This set of five mini black skulls would make a great accent for a Halloween display, or combine them with some larger skull candles in a group for an interesting effect. Skulls for spells - If it's magic you're into, these skulls come in different colors, depending on the sort of spell you wish to cast. If you're a candle maker or want to try your hand at making your own candles, Halloween themes are a fun place to start. Pick up a skull mold for candle making such as this one, and use it along with paraffin or soy wax to create candles in your choice of colors and scents. Use the basic candle making instructions found here. For a really great special effect, pick up some glow in the dark powder that can be used for candle making. Glow Inc. sells a nice variety of these. You can add the powder to the melted wax before pouring into the mold. A stronger glow in the dark effect can be achieved by putting a thin coating of vegetable oil or mold release spray on the mold, and then coating that with a layer of the powder. Pour the wax as usual and allow the candle to set. Only the outside of the candle will glow, but the glowing will be more noticeable than adding the powder directly to the wax. Candles are the perfect way to create an appropriately eerie mood for Halloween. Whether you're hosting a party, decorating your home, or delighting trick-or-treaters, skulls are one of the many Halloween symbols that you can use with your candles.